A 33-year-old female presented with a history of headache for 6 months. There was no history of seizures. Plain and contrast-enhanced computed tomography showed a large extra-axial completely ossified lesion with lobulated margins in the left frontal region with extension across the diploic space, into overlying scalp [[Figure 1] and Video 1]. There was no enhancing soft-tissue component. There was no perilesional edema. Craniotomy and near total excision of the tumor was done. Histopathological examination revealed metaplastic meningioma of ossific subtype. Meningiomas, the most common benign intracranial tumors, arise from arachnoid cap cells. They are also the most common nonglial primary tumor and most common extra-axial neoplasm. Meningiomas classically appear as hyperdense homogeneously enhancing mass. Calcification seen in 20%–27% of meningiomas is usually punctuate, but may be large. Ossified meningioma, classified histologically as a phenotype of metaplastic meningioma, is extremely rare and belongs to the WHO Grade I. Other histological phenotypes of metaplastic meningioma include cartilaginous, lipomatous, myxoid, xanthomatous, and cartilaginous tissue. The majority of ossific meningiomas are spinal in location with <20 cases of intracranial ossified meningioma reported so far., Clinical symptoms include headache, dizziness, seizure, blurred vision, and weakness of lower limbs. Surgical removal is the ideal treatment option, with radiotherapy being useful in recurrent cases. Although it is not extensively studied, overall prognosis of metaplastic meningiomas is good. Rohringer M, Sutherland GR, Louw DF, Sima AA. Incidence and clinicopathological features of meningioma. J Neurosurg 1989;71:665-72. Tai HC, Chen CJ, Chen CM, Chen WL, Chen PY. Ossified metaplastic meningioma with intratumoral hemorrhage. J Cytol Histol 2010;1:102. Tang H, Sun H, Chen H, Gong Y, Mao Y, Xie Q, et al. 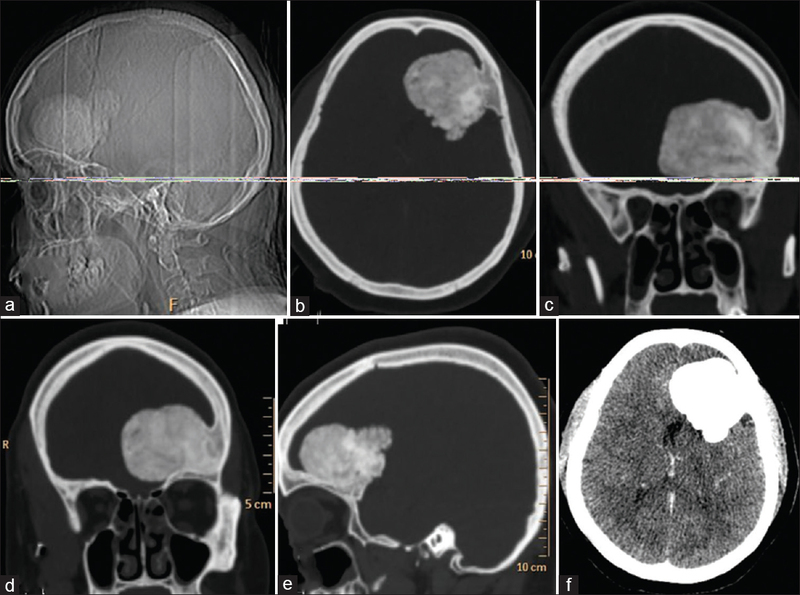 Clinicopathological analysis of metaplastic meningioma: Report of 15 cases in Huashan hospital. Chin J Cancer Res 2013;25:112-8.